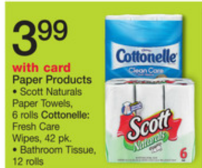 Head over to Walgreens to pick up Cottonelle Bathroom Tissue for only $0.17 per roll this week! What a great stock up price! $3.98 for two (2) or $1.99 a piece - ONLY $0.17 per roll!